Meow! by Laurie is my amazing friend Laurie's new cosmetic and skincare line that she has recently started. 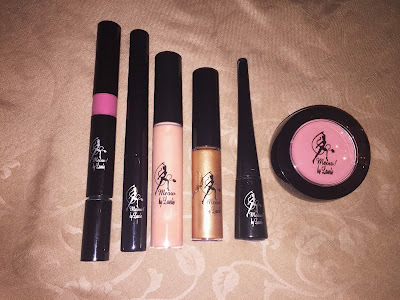 We all know I am a makeup junkie, so I was so excited to try these products out. All of Laurie's products are individually boxed. They are not tested on animals, are free of fragrances, parabens, are allergy-tested, and hypo-allergenic. Finding this out, it made me realize how many other popular makeup brands do some of these things that are dangerous to our skin and harmful to animals. So bravo, Laurie! Who doesn't love a product of good quality as well as being better for us and animals? Brow Fix Tint and Shaper in the color "Blondie"
Lipgloss in the color "Creme Fraiche"
Matte Liquid Lipstick in the color "Blossom"
Liquid Shimmer in the color "Treasure"
Liquid Liner in the color "Onyx"
Blush in the color "Sultry"
My top two favorite products are the brow shaper and the liquid shimmer. The brow gel fills in all of the "emptier" looking spaces in my brow, and makes them appear fuller. Because my hair is so light, this product really helps me out. I use the liquid shimmer on top of my powder highlighter as a way to set it. All of the products are great, but these two are my top two currently! Here I'm wearing the liquid shimmer and one of the matte liquid lipsticks in color "Danger"! Check out Laurie's website at www.meowbylaurie.com and take a look at all her products. I promise you won't regret it! Use code "AMANDABACKSTAGE" at checkout to reciece 10% off your order!